Authors have often resorted to thermal metaphors in order to illustrate complex issues of social transformation in the course of modernity (Lethen, 2001). After Marx and Engels established the ‘ice-cold water of egoistical calculation’ in which ‘the heavenly ecstasies of religious fervour’ had been drowned (1848/2004: 64), Plessner suggested that the ‘excessive cooling’ of modern society was being answered by an ‘excessive counter-model in the idea of a glowing … community’ (1924/1999: 28). Thermal metaphors thus make abstract notions such as ‘society’ and ‘community’ imaginable and tangible, but they also tend to naturalize both the social and the thermal by conveying an image of heat and cold as immediate and overwhelming forces. Yet, what if the thermal is more than an index of social forces; what if there is, after all, a thermal logic to social transformation? Against the dominant metaphorical use of the thermal, in this essay I attempt to think through its materiality and thereby explore novel analytical pathways for understanding social transformation. The work of Claude Lévi-Strauss offers a productive entry point for analyzing the complex relation between thermal metaphors and thermal materiality. His widely acclaimed – yet nowadays often hastily declared outmoded – metaphor of hot and cold societies, which constitutes a model for describing social (dis)order and transformation, has a critical potential that has been often overlooked. 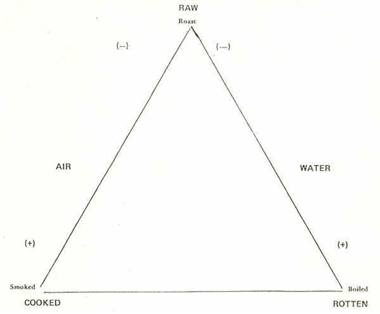 To trace this potential, I use Lévi-Strauss’s culinary triangle (1978) in order to suggest that the rotted – by contrast with the raw and the cooked – with its associated fermentation processes and practices, allows us to theorize social transformation beyond thermal metaphors such as ‘hot’ and ‘cold’ cultures. Unlike the ‘raw’ and the ‘cooked’, which have equivalents in ‘hot’ and ‘cold’ societies, the ‘rotted’ lacks a time stamp – at least in Lévi-Strauss’ own work. After briefly considering critiques of Lévi-Strauss’ emphasis on linguistic structures, I argue that it would be too simple to replace such an emphasis with a biologistic or scientistic understanding of thermal processes in order to account for the materiality of culture. I offer an alternative approach based on media theory, which recuperates the state of the rotted as a central yet undertheorized category in Lévi-Strauss’ culinary triangle. Beyond the ‘raw’ and the ‘cooked’, the ‘rotted’ offers us a different understanding of thermal materiality. On the one hand, such an understanding challenges the linear and anthropocentric logic tracing the transition from ‘raw’ to ‘cooked’. On the other hand, it allows us to question current metaphorical uses of fermentation in the critico-theoretical imagination. Indeed, notions of rotting, fermenting and composting inspire such an imagination from Marx’s distinction between the exploitation of the ‘living ferment’ of labour (1887: 131) and ‘revolutionary ferments’ (ibid. : 319) to Donna Haraway‘s model of ‘compost’ (2016: 57). A thermal and materialist consideration of the rotten in fermentation practices, however, allows me to challenge current vitalist optimisms that tend to forget over the dark and uncanny dimension of rotting matter beyond flourishing life. According to Lévi-Strauss, material factors and infrastructures such as the distance between food and the source of transformation, its mediation through utensils (e.g., pots and pans) or assisting media (e.g., water and air), the speed and thoroughness of the food transformation, the economic efficacy of the preparation method, and the durability of the food and the cooking receptacles, often indicate a degree of civilization. The material control of the cooking process is relevant primarily in terms of cultural control, which involves self-control (e.g., the capacity to wait, postpone, mediatize) and dominance over nature. Hence, Lévi-Strauss is less interested in whether foods are ‘good to eat’ than in whether they are ‘good to think’: ‘Cooking is a language through which that society unconsciously reveals its structure’ (Lévi-Strauss, 1978: 495). His structuralist model of the culinary triangle constitutes a semantic field based on the categories of the ‘raw’, the ‘cooked’ and the ‘rotted’. It presents a double opposition between ‘nature’ and ‘culture’ and between ‘processed’ and ‘non-processed’. These oppositions constitute a formal framework for the analysis of myths that use those polarities to express other, more general oppositions of ‘either cosmological or sociological’ significance (ibid. : 479). ‘Raw’, ‘cooked’ and ‘rotted’ describe material states, of course, but for Lévi-Strauss, they also serve as symbolic categories. As such, they are of interest in terms of their functions within the classification systems that structure the demarcation between ‘nature’ and ‘culture’. While the ‘raw’ occupies the ‘unmodified’ pole, the ‘cooked’ and the ‘rotted’ occupy opposite ends of the ‘modified’ pole. Boiling is regarded as a cultural transformation of the ‘raw’; rotting is instead regarded as a natural transformation (ibid. : 478). ‘Raw’ and ‘cooked’ stand in for other binaries: inside/outside, male/female, content/container, sacred/profane, and so on. Despite Lévi-Strauss’s explicit focus on linguistic structures, I want to explore the ways in which his culinary triangle begins to erode distinctions between nature and culture, in a way that allows me to conceptualize a thermal model of social transformation based on the rotten. Fig. 1. The Culinary Triangle (Lévi-Strauss,1968: 490). As Lévi-Strauss notes, the dichotomy between nature and culture is neither fixed nor synonymous with the opposition between ‘unelaborated’ and ‘elaborated’. What is considered raw or cooked varies through different societies and cultures. Nothing is simply cooked but everything has to be cooked in a specific way; also, there is no purely raw, unelaborated, ‘presocial’ state, because most food that is considered raw is actually processed in some way, for instance by washing, cutting or seasoning. Accordingly, the relation between the ‘raw’ and ‘cooked’ is less a rigid dichotomy than a continuum: objects and processes can be more or less raw, more or less cooked. Yet Lévi-Strauss argues that the poles of ‘raw’ and ‘cooked’, of ‘nature’ and ‘culture’, ‘unelaborated’ and ‘elaborated’ nevertheless constitute a surprisingly intact and stable order throughout various societies over time (see Lévi-Strauss, 1964). Through an interpretation of these factors, Lévi-Strauss identifies three modes of cooking with a specific materiality: roasting, boiling and smoking. Roasting has an affinity to the ‘raw’ because it constitutes a ‘non-mediatized conjunction’ (Lévi-Strauss, 1978: 479) between food and fire and always leaves a part of the food intact; roasting is thus located on the side of ‘nature’. The mode of boiling follows a ‘two-fold process of mediation’ (ibid. : 480) through a receptacle (the pot) and the elements of water and fire; boiling is thus placed on the side of ‘culture’. Finally, the mode of smoking corresponds to the ‘cooked’ due to its thoroughness, steadiness and slowness (ibid. : 487). Strikingly, the ‘rotted’ is the only mode whose preparation is explained on a purely symbolic-semantic level. Before briefly noting that rotting can happen in either spontaneous or controlled ways, Lévi-Strauss mentions the American soldiers in the Allied landings who destroyed the Norman cheese dairies because the strong odor reminded them of the smell of corpses. For Lévi-Strauss, this story simply demonstrates the different cultural interpretations of the rotted (1978: 478). Although the ‘rotted’ has a prominent position as one of the three elements of the triangle, the process of rotting is not explicitly fleshed out in the model, whether material-based or symbolic. How is it possible that the ‘rotted’, according to the figurative logic of the triangle, is even closer to the pole of ‘nature’ than the ‘raw’, even though it is much more transformed? Before taking a closer look at the rotted, I now turn to explaining how Lévi-Strauss expands the transition from the raw to the cooked to a characterization of entire societies by using a metaphor of hot and cold cultures. In cooking, there are different levels of abstraction that correspond to different levels of civilization: the grilled animal, which in its concreteness vividly reminded us of its bloody prehistory; and the stew, a more thoroughly transformed and thus more abstract form of food, which also enables more control over the fire and the cooking process as a whole. In ‘hot’ societies, these forms of sublimated cooking become a generalized principle – up to the point where perceptible heat and fire gradually disappear from the picture as they transform into ‘cool’ abstract energy (see Goudsblom, 1995). Although there are no cold societies in the strict sense, just as there is no purely raw food, Lévi-Strauss distinguishes two modes of temporality: the cyclic time model of cold (‘raw’) societies versus the linear model in hot (‘cooked’) societies. This model, inspired by the thermo-dynamic thought of movement, offers us a broader way to approach the logic of social (dis)order than cooking does. something like a horologe compared with a steam engine. These ‘cold societies’ produce extremely little disorder, that physicists call ‘entropy’, and they tend to preserve themselves in their initial state. Incidentally, it explains why they seem to us as societies without history or without progress. Cold societies aim to freeze social change, while hot societies internalize it so that it can drive their development. The fact that cold societies tend to preserve themselves in their initial state does not mean there is no change. But cold societies try to annihilate this change by building mechanisms – namely institutions – to prevent it. Lévi-Strauss compares these societies to a horologe, a clock-like mechanism that measures time in order to maintain cyclic rhythms in endless repetition, providing a steady regular movement that combats disorder. By contrast, he compares hot societies to steam engines, following a linear temporal logic. What Lévi-Strauss implicitly suggests is an energetic model of transformation, which produces metaphorical ‘heat’ by externalized energy – but this ‘heat by motion’ becomes imperceptible; it is a cool, abstract heat. Just as the stew does not remind us of the dead animal, electricity does not remind us of fire. In both cases, energy is externalized so that it can be efficiently transformed. The ‘rotted’, however, is not conceived in terms of temperature and temporality – could it be that a confusingly different logic beyond cyclic and linear, hot and cold slumbers in it? We will be coming back to that. Popular scientific writings like Catching Fire by the British primatologist Richard Wrangham (2009) and Cooked by the best-selling U.S. author Michael Pollan (2013), criticize Lévi-Strauss for reducing cooking to a mere metaphor for culture. The aim of Wrangham’s so-called ‘cooking hypothesis’ is to demetaphorize Lévi-Strauss by showing that cooking is a biological precondition for human culture rather than simply its metaphorical expression. Wrangham explains that the chewing and digestive apparatus of Homo erectus is poorly adapted to raw foods, so the development of fire control and cooking techniques are linked to the growth of the brain (Wrangham, 2009: 113). Digestion requires huge amounts of energy; it takes hard work for the body to process raw foods. Cooking literally externalizes this energy: it uses fire energy in order to save body energy. In this way, humans save time to spend on other things than ‘looking for food and chewing it’ (Pollan, 2013: 58). This externalization is possible due to the material capacity of heat, an external force that transforms the food in both physical and chemical ways (see Vilgis, 2013a, for a scientific perspective on the triangle). Heat ‘denatures’ proteins and breaks down raw indigestible foods into simple sugars. Heat changes foods’ texture and taste; it makes them sweeter or less bitter, more tender, altogether more enjoyable, and kills off bacteria. The cooking hypothesis invites us to rethink the materiality of cooking, yet I would argue that a critique of Lévi-Strauss’s culturalism does not leave us with a biologistic notion as the only alternative. Moreover, as Schrempp (2011) points out, Wrangham’s science of fire – even though vehemently distan-cing itself from myth – incorporates mythological patterns by constructing an ‘idealized species-formative moment set in the past’ (ibid. : 109). Such a fiction of scientific accuracy aims at capturing the history of human nature in its ‘real’ and ‘pure’ state in order to invoke a consistent narrative free from ‘irrational’ elements, and thereby turns into a myth itself – to the same extent as myths always contain traces of science. Thus, instead of following Wrangham’s scientistic path, I set out to reframe the question in media-theoretical terms by addressing the thermal organization of control in cooking and fermenting. The notion of cooking as cultural technique offers an analytical key to think the materiality of thermal processes without falling back into scientism. Moreover, as I will show later, a closer look at the status of the third figure of the triangle – the rotted – allows a new perspective on cultural techniques by confusing the opposition between the symbolic and the biological. Conceptualized by Bernhard Siegert (2013), the notion of ‘cultural techniques’ revives the early European understanding of ‘culture’ as the ‘development and practical usage of means of cultivating and settling the soil with homesteads and cities’ (Siegert, 2013: 56). This account stresses the technical and media objects involved in our agricultural heritage. The practices cannot be reduced to active human processing of passive material; rather, culture is a ‘complex actor network that comprises technological objects as well as operative chains they are part of and that configure or constitute them’ (ibid., 58). In other words, the distinctions that every culture starts with, such as ‘inside/outside’, are preceded by cultural techniques (like the door). According to Siegert, cultural techniques constitute media that process those oppositions. From this perspective, we can describe cooking as a cultural technique that organizes a mediation between a direct or indirect source of heat (e.g., fire), and an organic substance, the cooking material. This produces a thermal decomposition or thermolysis – a chemical transformation of the substance. The external heat is the medium of transformation, and its effect is again doubly mediated through the receptacle of the pot and an assisting medium, the water – which, like the fire, can be conceptualized as ‘elementary medium’ (Durham Peters, 2015). In this way, the food is transformed more gently yet even more thoroughly – and economically – than in the case of un-mediated roasting directly over the fire. An unmediated operation takes place as the layer of air between fire and meat is reduced to a minimum and nevertheless always leaves a part of the food intact. Boiling becomes a paradigmatic cultural technique in various senses: the pot mediates between heat and food and thus prevents the food from charring or burning; furthermore, it reduces the fire’s danger, keeping it under control. At the same time, however, the fire needs to be maintained in order to keep the process going, and keeping it supplied with fuel and oxygen requires careful time management. This material organization of control responds to the specific challenges linked to cooking, and in this way they force the people involved to coordinate and communicate (Goudsblom, 1995). The elementary scene of the social articulated here does not derive from the symbolic or linguistic, but from a material problem, namely the control of the fire via elementary media. We can therefore add a mediating function to the controlling medium of the pot: the physical and chemical process is connected to the biological system of human metabolism. As the cooking hypothesis suggested, the work of the human digestive apparatus is being delegated and partly done by the fire energy, by heat. This sort of delegation is a mediating process, too – heat becomes a medium in that it enables connectivity between different entities or bodies by a translation of energy flows that are beyond the conscious control of those bodies. Instead of functioning as ‘passive’ intermediaries, vehicles like the pot should be treated as ‘mediators triggering other mediators’ (Latour, 2005: 59). From this point of view, we can describe heat, water, pot and digestion as ‘concatenations of mediators where each point can be said to fully act’ (ibid.). The material organization of heat allows us to address the specific temperature work in the process of cooking on a micro-level, and, moreover, decenters the human subject, which now is only one of many factors within a network of heat work. Before discussing what this analytical perspective of cultural techniques means for the rotted, we must specify the theoretical status of the rotted in the culinary triangle. I argue that the state of the rotted is a central yet undertheorized category that offers us an alternative concept of transformation, challenging the linear and anthropocentric logic tracing the transition from raw to cooked. I will argue, first, that fermentation is a specific cultural technique that extends the notion of culture through its nature of wild and nonhuman cultures, thus nature-cultures; and, second, that it offers an alternative model of change to the linear ‘hot societies’ model. Thereby, the rotten will prove to be the excluded yet included third – a constitutive yet destabilizing category for the dominant line from raw to the cooked. In Lévi-Strauss’ triangle, the rotted occupies a highly visible and yet widely neglected role that, using Michel Serres’s category of the parasite, can be grasped as the ‘Excluded Third, Included’ (Serres, 1982: 22). Serres treats the parasite literally as a category originating from the metabolism when he notes that ‘to parasite means to eat next to’ (ibid. : 7). With Serres, the rotted in the culinary triangle can be described as parasitic in a double sense. First, as a category the rotted resists location on the side of nature because it is modified, and on the side of culture because its modification occurs by natural rather than cultural means. Second, rotting is a literally parasitic process, as the involved bacteria always eat next to different human and nonhuman hosts, ranging from the digestive tract of animals and humans to all kinds of microorganisms. In this perspective, rotting is an omnipresent, inevitable and spontaneous process of life. When it comes to the food of humans, we are dealing with a specific controlled mode of rotting: fermentation. Both modes rely on the same lively movement of bacteria that requires specific environmental conditions in order to be maintained. Inspired by thermodynamics, Serres notes that the ‘best definition’ of the parasite is that it functions as a ‘thermal exciter’ (ibid. : 190): it affects the energy distribution within a system by warming it up or cooling it down, by producing thermal noise and disorder. To outline the rotten as a thermal category and as cultural technique with various control mechanisms, we have to take seriously the material frame of reference Lévi-Strauss suggests for boiling and roasting, especially the mediatory aspect, without applying the representational frame of myth and symbol. From that point of view, the different material and media ecologies of cooking and fermenting can be revealed by mapping the involved organizational modes of temperature. There is something miraculous about a common substance like juice turning into wine, a mysterious transformation that – not coincidentally – is the crucial motif of many myths. For a long time, the word ‘fermentation’ was translated as ‘boiling’, but people could not tell how this boiling was possible without heat. Michael Pollan (2013: 291) speaks of ‘fermentation’s cold fire’ in order to emphasize the puzzle of the process. The common ground for all types of fermentation is the liveliness of its agents, the bacteria. Fermentation presupposes the movement of living bacteria that transform organic matter into acids, gas or alcohol. Enzymes, consisting of molecules, the smallest units of living matter, are reduced to simple foods, either for themselves or for other living beings. This primal metabolic process breaks living things down, reducing them so that their energies and atoms can be reused (see Buckenhüskes, 2013: 12ff.). While cooking relies on an external source of heat, fermentation is always based on an internal mechanism ruled by molecular biological laws: a ferment produces its energy internally and can be seen as a sort of molecular biological cooking process, while specific molecular groups simultaneously remain in their untransformed “raw” state (Vilgis, 2013b: 39). The transformation process of fermented foods is particularly dramatic. The external transformation is most likely visible and can be sensed through vision, taste and smell: the colors and textures of the substrate usually change, fermentation intensifies foods’ flavor, but also alters it, producing new tastes like umami and sweetness (ibid. : 44f.). By contrast, the inner transformation is opaque, because it happens at a microscopic scale that is invisible to the naked eye. Foods become much more nutritious because the process synthesizes entirely new vitamins. Foods become more digestible because long chains of proteins, fats and carbohydrates are broken down into simpler, safer forms. And finally, foods become more durable and can be stored longer. When it comes to human digestion, the fermentation has the same energy-saving function as cooking: fermenting is a form of pre-digestion and thereby saves energy. Gaston Bachelard notes: ‘The yeast mixed into dough aids digestion. And digestion is a form of cooking which begins with the fer-mentation of the yeast. Blaise de Vigenere asserts this explicitly: “Leavening added to dough cooks it from within”’ (Bachelard, 2011: 92). But unlike cooking, fermentation does not kill off enzymes; rather, it cultivates them. The energy is not generated by the fuel but is self-generated by the metabolism of the microbes penetrating the substrate. The bacteria, fungi or enzymes keep the fermentation going through their own enzyme-catalyzed metabolism. Small metabolisms are embedded in bigger ones and converge in huge cyclic rhythms in steady repetition. The specific temporality constituted by fermentation seems to be one of cyclic memory, of slowdown and conservation, but, importantly, it generates a movement that involves not only life but also death. In fact, the life of these bacteria means decay, decomposition, rot; due to this paradoxical character of life processes that work on their own dissolution, Eugene Thacker (2012: 26) speaks of fermentation as a laboratory for a ‘necrological vitalism’. As I will discuss in my concluding section, this uncanny figure of flourishing death via self-digestion demonstrates the limits of the assumed cyclic logic of endless repetition. We might understand fermentation as a cultural technique similar to cooking. But instead of an extreme and externally applied heat as a medium of transformation, fermentation requires invisible, steadily and subtly tempered ecologies. Whereas the control in cooking can be exercised through certain media – for example, objects like the pot – fermentation introduces a media-ecological model. The controlled fermentation of foods (e.g., cheese, sauerkraut, kimchi, kefir or wine) relies on the interruption of rot which means that the fermentor has to manage the rot carefully; the decomposition must proceed to a certain point – but no further. If the process keeps going, the substrate will decompose entirely and return to humus, the half-dead organic material of the soil. Temperature is not a medium of transformation anymore; rather, it is a media condition and effect. The transformation itself is effectuated by the activity of the bacteria, which take over the role of the medium so that there is no distance between medium and material any longer. Rot management strategies involve temperature control, as fermentation usually requires specific outside temperature ranges (Karlin, 2013: 14; Buckenhüskes 2013; Vilgis 2013b). Most of the lactic acid bacteria are metaphilic, which means they can cope with normal room temperatures of 18 to 22°C, whereas others – for instance, many yogurt cultures – are thermophilic and need cozier temperatures of 42 to 45°C. But what most bacteria have in common is that temperatures below 10°C prevent the start of fermentation or suppress its activity. Within this ideal climate, fermentation follows a time-temperature logic: higher temperatures speed the process up, lower ones slow it down. Fermentation not only depends on a thermal environment, but also produces heat and constantly undergoes pressure changes. It requires careful management of air, for which specific devices have been developed, such as the fermentation lock or air lock often used in brewing or wine making. The air lock enables the release of the carbon dioxide produced by fermentation in order to rule out implosions in poorly vented tanks; at the same time, by preventing air from entering the fermenter, it prevents oxidation. With Kember and Zylinska (2015) who note that mediation itself becomes a vital process, we can describe fermentation as nature-cultural technique processed by a medium that creates its own energy through a self-organized movement of life and decay, continuously working like a circular organic machine. Additionally, there are two assisting media in the scene of the fermentation laboratory: first, a jar that forms the microecology by sealing itself carefully off the outside milieu of oxygen; and second, the liquid of the salted brine that is in direct contact with the bacteria and the organic material. Instead of a separation between medium and food, an inseparable totality of the substrate, the medium of transformation and assisting media objects is required that ensures the same thoroughness and steadiness of transformation as cooking does. But what regulates the fermentation process is the ferment’s environment, its ecology; thus, the environment itself becomes the target of control when it comes to its systematic regulation. At what point do cooking and fermenting turn into thermopolitics, as something distinct from political metaphors? With his term ‘thermocracy’, French philosopher and mathematician Gilles Chatelet departs from a metaphorical reduction of the thermal. Instead, he addresses ‘hydraulic despotisms’ (2014: 77) that consist of a ‘social chemistry that operates internally, through dissolutions, catalyses and fermentations that implacably inundate the bulkheads that supposedly divided off the spheres of politics, economics, and the social’ (ibid.). Even though Chatelet’s notion seems to seamlessly fit in the repertoire of illustrative figures of speech, it transcends the metaphorical level by taking the internal organization of thermal phenomena literally as an analytical inspiration to rethink the social. To conceive of politics, economics and the social as areas that are being organized, controlled and divided through thermal processes amounts to focusing on processual and emergent micro-changes within a specific milieu. In Chatelet’s words, thermocracy dissolves politics into ‘microconfrontations’ (ibid. : 56) and requires a thermometer that regulates and neutralizes the ‘market-chaos of opinions’ (ibid. : 60). While big social changes such as modernization are often expressed through thermal metaphors, thermocracy departs from a microlevel of transformation – a ‘social chemistry’ – that nonetheless involves the political question of (de)stabilization on a large scale and the epistemological question of the nature/culture distinction. We can draw a connection between on the one hand the production of heat and cold on a microlevel, their maintenance through specific modes of regulation and control, and their measurement through apparatuses such as thermometers and, on the other hand, the political dimension of these microprocesses. Bringing together these dimensions, cooking and fermenting can be grasped as micro-models of thermal change which are based in concrete material practices. A close look at cooking and fermenting qua techniques of temperature control reveals the limits of purely metaphorical approaches to thermopolitics, and opens up to an alternative materialist and thermopolitical pathway to challenging the nature/culture distinction. Thacker (2005: 61) sees fermentation as a field of biotechnology where the notion of ‘life itself’ becomes indivisible from the ‘uses of life’ (also see Bud, 1993). Historically, pasteurization accompanies the nature-cultural technique of fermentation. Pasteurization is a type of ‘microbiopolitics’ (Paxson, 2008) that is used as a common method to prevent certain dangers occurring in the rotting process. The discovery of pasteurization is a relatively recent one and coincided with the scientific discovery of fermentation as such. In The Pasteurization of France (1988), Bruno Latour draws on this discovery of the microbe as an actor and describes its movement through the disciplines. In the middle of the nineteenth century, Louis Pasteur debunked the contemporary assumption of fermentation as an abiotic process with scientific evidence that the crucial force responsible for fermentation processes was the life of microorganisms, or, as he defined more precisely, life without air. Proceeding from the question how he could observe the bacteria at work, he isolated contagious ferments and transferred them into a new ideal environment – the Pasteurian Laboratory, where he could study those little agents, their movements and contagious dynamics in homogeneous aggregates (ibid. : 82). In observing such environmental logics, Pasteur introduced the scientific creation and examination of relatively autonomous yet relentlessly manipulated nonhuman cultures. Like fermentation, pasteurization depends on a time-temperature relationship. Instead of letting the bacteria flourish, however, pasteurization kills off all pathogenic microorganisms in liquids like milk or juice by shortly heating it up. After this elimination of the native bacteria, one can start with a blank page and add only the ‘useful’ purebred culture bacteria from outside to speed the process up and to guarantee a standardized product without any nasty surprises. Pasteurization is a control mode that works preventively (see Lemke, 2010) by presenting an upstream thermal answer to a thermal problem – a way of infiltrating a purely immanent process by employing its own logic. However, pasteurization extracts and transfers the subtly tempered media ecology of fermentation into a regime of extreme temperatures hostile to life by reintroducing the cooking principle – extreme heat – and by replacing the ‘natural’ storage function of fermentation by hygiene practices of extreme coldness: cool storage, cold chains, freezing. Isolated from all the others, microbes grow enthusiastically in these media, which none of their ancestors ever knew. They grow so quickly that they become visible to the eye of an agent who has them trapped there … This time it is the man bent over the microscope who is enthusiastic. This event completely modifies both the agent, which has become a microbe, and the position of the skillful strategist who has captured it in the gelatine … He was now going to be able to modify the culture medium, starve the microbes, kill them with antiseptics, make them eat anything, in short, torture them in innumerable ways, in order to learn something abouth them each time. Based on the Pasteurian assumption that bacteria had to be controlled and battled, hygienists, politicians and economists set the ground for what they understood to be ‘pure’ social relations, that is, those that could be managed rationally and must be protected from the dangerous, chaotic impact of microbes. Biopolitics, as Michel Foucault analyzed it, is followed by microbiopolitics, a discursive as well as material creation of actors of microscopic size and their selective flourishing as well as the war against them by means of antibiotics, vaccination, disinfection and pasteurization (Paxson, 2008: 16f.). Throughout the twentieth century, food more and more became a metaphor for a social stability versus decay; thus, public health campaigns for ‘good food’ and the proclaimed virtues of cleanness, hygiene, health and discipline stand in the service of a socio-political dream of purity (see Bobrow-Strain, 2012; DuPuis, 2015). Strikingly, the micro-biopolitics of bacteria make the distinction between metaphor and materiality vanish: though the notion of ‘pure social relations’ might be a fantasy, it is literally realized by eliminating living bacteria. The politics of purity is a material politics of segregation between the species of humans and bacteria – a politics, however, that quickly comes to its limits. Letting Go: The Utopian Energy of Fermenting? Fermentation is everywhere, always. . . . Microscopic bacteria and fungi (encompassing yeasts and molds) are in every breath we take and every bite we eat. Try – as many do – to eradicate them with antibacterial soaps, antifungal creams, and antibiotic drugs, there is no escaping them. They are ubiquitous agents of transformation, feasting upon decaying matter, constantly shifting dynamic life forces from one miraculous and horrible creation to the next. Interestingly, Katz’s critique centers on a strong, vitalist notion of life that derives from the liveliness of the bacteria. The crafting practices aim at becoming independent from the lifeless, overprocessed food of the industry: ‘Industrially produced food is dead. It severs our connection to the life forces that sustain us and deprives us of our access to the powerful magic so abundantly present in the natural world’ (ibid. : 27). Instead, the goal is to cooperate and engage with the bacteria in a sort of interspecies network – a notion that strongly recalls Donna Haraway’s ‘compost’: ‘I am a compost-ist, not an posthuman-ist: we are all compost, not posthuman’, she claims (2015: 161). The theoretical appeal of the compost lies in its endless, nonsubjective process of becoming that opens up to a radicalization of posthumanist thinking (also see Hird, 2010). It expands the approach of ‘companion species’ (Haraway, 2008) from humans and animals to plants, bacteria and fungi, ‘our biotic and abiotic symp-poietic collaborators, co-laborers’ (Haraway, 2015: 161), intermingling with the other species in a huge movement of recycling. Precisely in this sense, the Post-Pasteurian slogan of ‘cultural revival’ and the battle against ‘cultural homogenization’ emphasizes a notion of culture that encompasses both microbial and human culture – and, in this way, embraces the collapse of the nature/culture distinction. The nature-cultural technique of fermenting is confronted with the wild and spontaneous form of cultures that evolve in a process of self-organization and autopoiesis. Crucial to the desired revival is the omnipresent transformation process, the emergence of something new and unexpected initiated by the proliferation of wild ferments – a dynamic that emphasizes the role of contingency. Clark explains that for the DIY culture of punk cuisine, industrial food is criticized as overly ‘cooked’: ‘milled, refined, butchered, baked, packaged, branded and advertised’ (2004: 20). As a reaction, these subcultures seek food that is ‘rawer’, closer to ‘its wild, organic, uncultured state’ (ibid.). In the example of fermentation activism, the rotted is considered even rawer than the raw due to its liveliness (an idea that is implicitly anticipated in Lévi-Strauss’s culinary triangle); but at the same time, it is more cultural than the raw because of the control regimen it presupposes. Yet this control dimension remains strangely absent in the fairly enthusiastic and somewhat romanticizing speech of contingency and interspecies colla-boration in both social theory and fermentation subculture. This becomes clear when Haraway speaks of the compost in terms of temperature and temporality: ‘The unfinished Chtulucene must collect up the trash of the Anthropocene, the exterminism of the Capitalocene, and chipping and shredding and layering like a mad gardener, make a much hotter compost pile for still possible pasts, presents, and futures’ (Haraway, 2016: 57). What Haraway outlines here is an excessive image of the compost – the hotter the better. But as euphorically as Haraway presents the compostism, isn’t it somewhat resigned in the end? The compost is the waste disposal of the Anthropocene, it collects its garbage in order to rescue what is left and to feed the remains to a huge movement of recycling and sustainability. Echoing these ideas, some even speak of a ‘fermentational turn’ to praise the practice of fermenting as a synonym for theoretical and political-ethical visions. The very material practice of fermentation and composting becomes intertwined with the symbolic-political critique connected to it and seems to blur the distinction between metaphor and materiality. However, despite of the materialist narrative Haraway and the fermentation activists have in common, their politicizising attempts re-metaphorize fermentation – and by constructing an image of interspecies relations in places tend to forget over the fragile yet strictly organized media and control practices that are immanent to fermentation both on the level of human control and on selfcontrol of the microbial culture (also see Helmreich & Paxson, 2013). As I have shown throughout the essay, even wild fermentation installs a highly regulative media environment, depending on selective boundaries between the fermenting inside and the non-fermenting outside. This leads us to the question of the temporality of fermentation again: Limiting fermentation to the endless cycle of ubiquitous, flourishing life and renewal – as vitalist accounts tend to do – means to overlook that fermentation irritates and interrupts this very cyclical logic of life by introducing the irreducible principles of death and mortification. In Dark Deleuze (2017), Andrew Culp polemizes against the joyous and affirmative path of new materialist and Deleuzian readings and replies to it by unfolding the hidden dark and ‘negative’ line the late Deleuze holds for the rethinking of revolutionary change. Accentuating this dark line, where assemblages are replaced by un-becoming, fermentation would not stand for the recycling of the existing world, but for its slow inner destruction. Indeed, it is not only the Anthropocene or the Pasteurian scientist who is controlling and torturing the microbes; fermenting means that the involved bacteria eagerly begin their decay work by killing other ‘bad’ microorganisms in a necrological zombie-like movement between self-preservation and self-elimination. Fermentation always has this uncanny, almost bleak dimension to it: it is only the thin semi-permeable membrane of the gastro-intestinal tract that prevents us from digesting ourselves. Where is this dark side of fermentation in the peaceful compost picture, its necrological vitalism with its inseparable dimension of rot, death and decay? While Haraway simply locates it in the trash image of the Anthropocene, and whereas the compost heap stands for renewal and life, a look at the material micro-processes of fermentation reveals the dark foundation of fermentation itself – its uncanny underworld of dissolution and mortification. And still, what this dark side of fermentation might hold for unknown futures will always be echoing its productive potentialities – and thus escaping pure darkness. Bachelard, G. (2011) Earth and Reveries of Will: An Essay on the Imagination of Matter. Trans. K. Haltman. Dallas: Dallas Institute Publications. Bobrow-Strain, A. (2012) White Bread. A Social History of the Store-Bought Loaf. Boston: Beacon Press. Buckenhüskes, H. J. (2013) ‘Vergorenes Gemüse. Fermentationsverfahren am Beispiel des Sauerkrauts’, Journal Culinaire 17: 8-21. Bud, R. (1993) The Uses of Life: A History of Biotechnology. New York: Cambridge University Press. Clark, D. (2004) ‘The Raw and the Rotten: Punk Cuisine’, Ethnology 43(1): 19-31. Culp, A. (2017) Dark Deleuze. Minneapolis: University of Minnesota Press. DePuis, E. M. (2015) Dangerous Digestion: The Politics of American Dietary Advice. Oakland: University of California Press. Durham Peters, J. (2015) The Marvelous Clouds: Toward a Philosophy of Elemental Media. Chicago: University of Chicago Press. Goudsblom, J. (1995) Fire and Civilization. New York: Penguin. Haraway, D. (2015) ‘Anthropocene, Capitalocene, Plantationocene, Chthulucene: Making Kin’, Environmental Humanities 6: 159-165. Haraway, D. (2016) Staying with the trouble: Making Kin in the Chthulucene. Durham and London: Duke University Press. Hird, M.J. (2010) ‘Indifferent Globality: Gaia, Symbiosis and “Other Worldliness”’, Theory, Culture & Society 27(2–3): 54-72. Helmreich, S. & H. Paxson (2013): ‘The perils and promises of microbial abundance: Novel natures and model ecosystems, from artisanal cheese to alien seas’, Social Studies of Science 44(2): 165-193. Karlin, M. (2013) Mastering Fermentation. Recipes for Making and Cooking with Fermented Foods. Berkeley: Ten Speed Press. Katz, S. E. (2001) Wild Fermentation. Vermont: Chelsea Green. Kember, S., & J. Zylinska (2015) Life after New Media: Mediation as a Vital Process. Cambridge, MA: MIT Press. Latour, B. (1988) The Pasteurization of France. Trans. A. Sheridan and J. Law. Cambridge, MA: Harvard University Press. Latour, B. (2005) Reassembling the Social: An Introduction to Actor-Network-Theory. New York: Oxford University Press. Lemke, T. (2011) ‘Beyond Foucault: From Biopolitics to the Government of Life’, U. Bröckling et al. (eds), Governmentality. Current Issues and Future Challenges. New York: Routledge, 165-184. Lethen, H. (2002) Cool Conduct: The Culture of Distance in Weimar Germany. Trans. D. Reneau. Berkeley: University of California Press. Lévi-Strauss, C. (1966) The Savage Mind. Trans. G. Weidenfeld and Nicholson Ltd. Paris: Librairie Plon. Lévi-Strauss, C. (1978) The Origin of Table Manners: Introduction to a Science of Mythology: 3. Trans. J. and D. Weightmann. New York: Harper and Row. Lévi-Strauss, C. (1994 ) The Raw and the Cooked. Trans. J. Cape. London: Pimlico. Marsalek, J. (2011) ‘Innovations and Temporality: Reflections on Lévi-Strauss’ “Cold Societies” and Our “Warming” Science’, in J. Loudin and J. Hochgerner (eds), Social and Cultural Dimensions of Innovation in Knowledge Societies. Prague: Filosofia, 139-149. Marx, K. (1887) Capital: A Critique of Political Economy. Vol. 1. Trans. S. Moore and E. Aveling. Moscow: Progress. Marx, K. & F. Engels (2004) The Communist Manifesto. Transl. L.M. Findlay. New York: Broadview editions. Paxson, H. (2008) ‘Post-Pasteurian Cultures: The Microbiopolitics of Raw-Milk Cheese in the United States’, Cultural Anthropology 23(1): 15-47. Plessner, Helmuth (1999) The Limits of Community. A Critique of Social Radicalism. Transl. A. Wallace. New York: Prometheus Books. Pollan, M. (2014) Cooked: A Natural History of Transformation. New York: Penguin. Schrempp, G. (2011) ‘Catching Wrangham: On the Mythology and the Science of Fire, Cooking, and Becoming Human’, Journal of Folklore Research 48(2), 109-132. Serres, M. (1982) The Parasite. Trans. L. R. Schehr. Baltimore: John Hopkins University Press. Siegert, B. (2013) ‘Cultural Techniques: Or the End of the Intellectual Postwar Era in German Media Theory’, Theory, Culture & Society 30(6): 48-65. Thacker, E. (2005) The Global Genome. Cambrige, Mass. : MIT Press. Thacker, E. (2010) After Life. Chicago: University of Chicago Press. Vilgis, T. (2013a) ‘Komplexität auf dem Teller. Ein naturwissenschaftlicher Blick auf das “kulinarische Dreieick” von Lévi-Strauss’, Journal Culinaire 16: 109-123. Vilgis, T. (2013b) ‘Fermentationen. Molekulares Niedrigtemperatur-Garen’, Journal Culinaire 17: 38-53. Wrangham, R. (2009) Catching Fire: How Cooking Made Us Human. New York: Basic Books.